This awareness course is designed to equip you with all the need-to-know knowledge about The Open Group’s TOGAF standard. Completing this course will make you aware, confident and informed about what the TOGAF standard is, its background, how it works and what it can do for you and your organization. This course is perfect for anyone wanting to gain a basic overall view of TOGAF, anyone needing to ‘sell’ TOGAF internally within an organization, or for anyone simply wanting to know more about TOGAF before committing to the full TOGAF 9 Foundation or TOGAF 9 Certified training and examination. Released in 2011, the Open Group TOGAF Standard Version 9.1 is focused on designing, planning, implementing, and governing an enterprise information technology architecture. With this course, you’ll receive 6 months access from the date of purchase as well as a FREE certificate of completion on successful course completion! Why Study TOGAF Awareness with 4PA? The course comprises four modules consisting of six sections each. At the conclusion of each module, there are six multiple choice questions to help you retain knowledge and check your understanding. 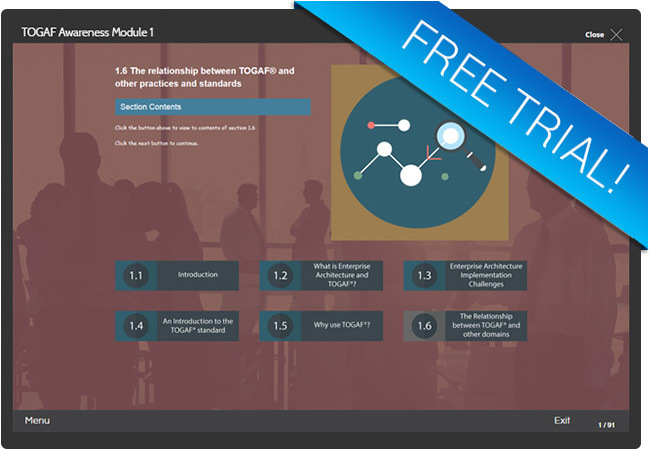 The free trial for TOGAF Awareness is taken from module 1 – ‘An Introduction’ and will cover a brief outline to what Enterprise Architecture and TOGAF are. Users of the free trail will be able to learn about what Enterprise Architecture is, what an Enterprise Architect does, and introduction to the TOGAF standard, the four stages of Architectural Maturity and the business benefits. This free trial consists of one section from module one. The full awareness course comprises four modules, each consisting of six sections, and over one hundred multiple choice questions. Like the full TOGAF Awareness eLearning course, you can access this free trial module from any device whether you are at home, at work, or on the move!